skin health and can be tailored to meet the specific needs of all skin types. It offers instant, noticeable results with no downtime or irritation. The treatment removes dead skin cells and extracts impurities while simultaneously bathing the new skin with cleansing, hydrating and moisturizing serums. The treatment is soothing, refreshing, non-irritating and immediately effective. Hydration is the foundation of healthy, radiant skin and this treatment is the best treatment available on the market today for hydration and moisturizing. Our highly qualified medical esthetician will evaluate your skin and determine if you are a candidate for the treatment. 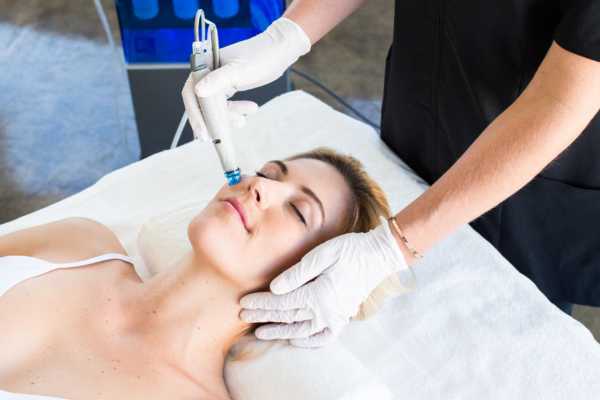 The HydraFacial MD® treatment is designed for all skin types. Even the most sensitive skin easily tolerates the treatment. Your physician or skincare professional may choose specific treatment serums and/or customize the treatment for your unique skin conditions and needs. Consult your physician or skincare professional for a skin evaluation and sensitivity test. Our clients report seeing visible skin refinement and an even, radiant skin tone after just one treatment. They leave with smooth results and hydrated skin. We don’t believe in quick fixes, so one treatment per month is recommended for improving the appearance of fine lines, wrinkles, hyperpigmentation, oily and congested skin. Continued treatments are highly recommended to maintain skin health results. The following, unretouched images are of people who have undergone a series of treatments. The photos demonstrate its ability to dramatically improve hydration while helping to eliminate the appearance of fine lines, hyperpigmentation, oil & congestion and even creases in the nasolabial folds.